The X68000 Pro is the successor of the X68000 Expert. It was launched in the same time than the X68000 Pro II and seems to have the same characteristics. However it has a new main board and the stereo scope port has been removed. 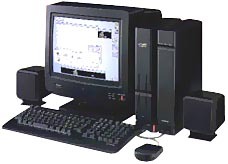 A X68000 Expert II HD (for Hard-Disk) was also produced. see more Sharp X68000 Expert II Ebay auctions !